Foxfinder, folded for storage/travel. Velcro fasteners keep antennas in place. Hidden transmitter hunting, aka fox hunting, is a fun activity with serious overtones. Ideally it’s a game, but the same equipment and skills can help find those in distress or track down a jammer. This post provides a schematic and construction details for a circuit developed by Dave Sharpe, KIØHG. 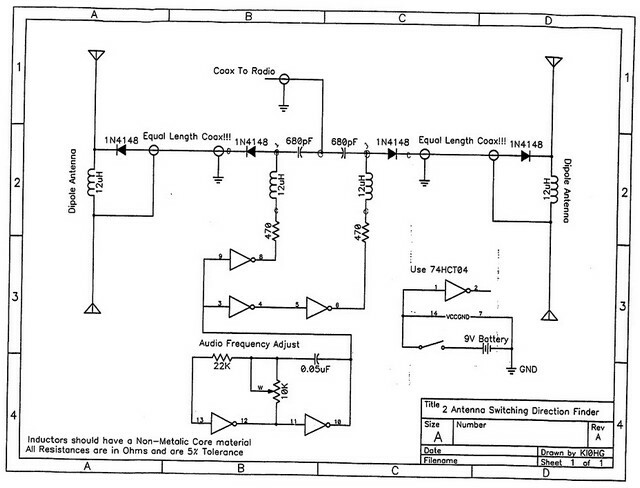 His circuit below is by far the simplest direction finder I’ve run across. It works with two dipoles on a pole and provides a tone when the antenna array isn’t quite pointed right, and nulls the tone when it is. I’ve used mine in many a two-meter fox hunt and it takes me right to the fox. Let’s start with the schematic. The audio tone is generated by two of the NOR-gates back to back with the 22K fixed resistor and the 10K potentiometer along with the .05μF capacitor. The antenna jacks at one end of the fox finder. Both ends are identical. 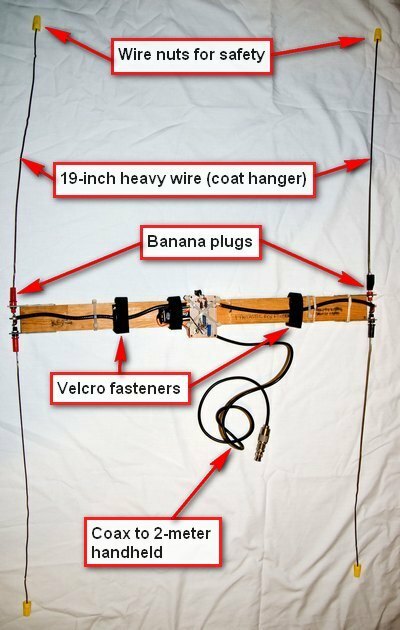 I chose to connect the 19-inch antennas with banana plugs. The inductors can be store-bought, or can be made by winding magnet wire using a 1/2-watt high-value resistor—the old-fashioned cylindrical kind. The resistor should be greater than 100KΩ. The resistor is not important to the circuit. The pieces of coax from the circuit board to the antennas must be of the same length! Get this right, down to the millimeter! 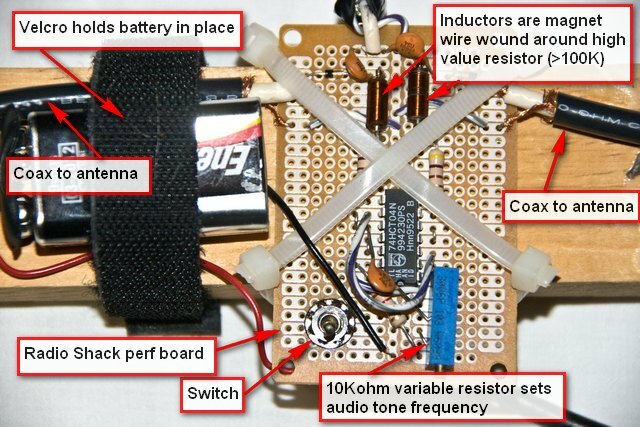 A Radio Shack perf board makes a great circuit board, as shown in the figure below. Foxfinder perfboard, Radio Shack 276-150. Foxfinder with antennas inserted. I used coat-hanger wire. You can also use welding rod. Note the wire nuts on the tips for safety. You don't want to get poked in the eye! Components are available at Radio Shack or at www.jameco.com. 1N4148 diodes, Jameco 151247 (also available from Radio Shack), 2¢ each. 470Ω resistors, Jameco 690785 (also available from Radio Shack), 2¢ each. 22KΩ resistors, Jameco 691180 (also available from Radio Shack), 2¢ each. 10KΩ potentiometer, Radio Shack 271-343, $2.99 each, also available from Jameco as part number 241294. Circuit board, I used Radio Shack 276-150, $1.99 each. Be careful wiring and have fun! Fox Finder operating instructions in another post. This entry was posted in Ham Radio blog entries and tagged 74HCT04, fox hunting, hidden transmitter hunting, Jameco.com, KI0HG, Radio Shack, switching direction finder, TDOA hidden transmitter finder. Bookmark the permalink. You mention operating instructions for the fox finder but no link. Help! Jerry, the dimensions are not critical. Mine is 25 inches long. 1 Question, what are the dimensions of the board in the middle? Dave, thanks for the demonstration and program at the club meeting. Also for posting this on your website. I have orderes my parts and hope to have an antenna assembled shortly.